Ribbon cutting ceremony signifies the official start of CPMA’s 2019 trade show. Canada’s new minister of Agriculture cuts the ribbon. Others in attendance include Les Mallard, Guy Milette and Ron Lemaire. Julie & Andy Tudor with Rainier Fruit out of Washington. New display from Rainier Fruit. These displays are fully customizable and customers can choose the graphics. The display in the photo contains graphics of both Envy and Jazz apples in one. It was very busy at the new booth of Montreal-based Canadawide. Pictured are Jessica Dubé and George Pitsikoulis. Nick Kouimanis of Canadawide also grabbed a picture opportunity, together with Jessica Dubé. 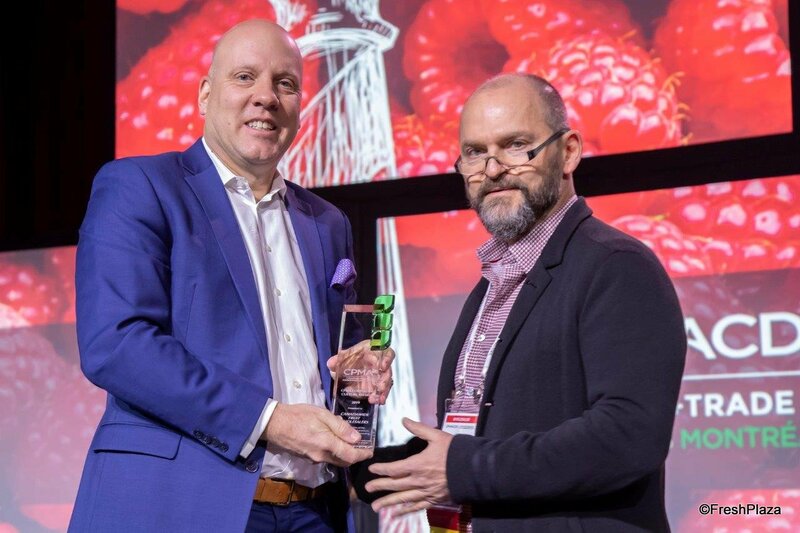 George Pitsikoulis with Canadawide Fruits receives the CPMA Corporate Culture Award. Canadawide is the inaugural winner. Emily Murracas and Ajit Saxena with Mucci Farms proudly show the company’s new Simple Snack packaging. The Simple pack is made of cardboard with 100% recyclable lidding film. Once again, Mucci Farms sponsored the relaxation lounge. The sign and chairs are all made of flame-resistant cardboard. The Eco lounge is very popular and not only used to relax, but also to work and have meetings. Mucci’s maintenance manager Joe Sleiman made these tables and chairs out of pallet wood and repurposed wood. The team of EarthFresh Foods in the winning booth. The company served fresh-cut fries and drinks out of an Airstream trailer. EarthFresh took home no less than two awards. For the second year in a row the company won the Best Island Booth award. In addition, EarthFresh received the Fresh Health award for promoting the Half Your Plate campaign. The Half Your Plate logo can be found on all of the company’s packaging. The booth attracted lots of visitors. Steve Page and Greg Akins with Catalytic Generators. Catalytic just launched a new ethylene generator for the North American market. The lid of the new generator seals better and allows for the user to see the amount of liquid available in the tank. Volm Companies and Jasa Packaging are partnering on this new sleevers product. The paper sleeve protects the product, but also allows the consumer to see it. Willem de Jong with Volm Companies and Wim van der Meulen with Jasa Packaging. Jasa manufactures the sleeving machines. Several of Volm’s packaging options are shown in the background. Cornelius Neufeld and Ray Wowryk with NatureFresh Farms show cherry tomatoes on-the-vine and long sweet peppers. Early June NatureFresh Farms is expected to launch 2 lbs. clubstore packs with cherries on-the-vine. The product will be sold under the NatureFresh label and will have a premium look. A new product from NatureFresh Farms: long sweet peppers. Kara Badder with NatureFresh Farms is part of CPMA’s Passion for Produce program. A happy California Giant team. From left to right Anthony Gallino, Helena Beckett, Morgan Maitoza and Nick Chappell. A proud team of Giumarra Companies. From left to right: Jack Hall, Gary Caloroso, Mimi Corsaro, Jeannine Martin and Victoria Serrano. John Caragliano with Limoneira proudly shows a pouch bag of Meyer lemons. The latest addition to Oppy’s team of growers: British Columbia based Perpetual Vegetable Company. From left to right: Vijay Randhawa (who owns the company together with his two brothers), his wife Sandeep Randhawa and Kirendeep Gill with Perpetual. Present from Oppy are Kelsey Van Lissum, Karin Gardner and Aaron Quon. Kevin Guadagnini, Chris Faxon and Mark Reed with Sinclair International stand behind a pattern labeling machine. Any pattern can be programmed in Sinclair’s pattern labeler. The team of Babe Farms in front of colorful products that photograph well. From left to right: Ande Manos, Babe Farms' founder Judy Lundberg-Wafer, Jeff Lundberg and Rocio Munoz. A new product from Babe Farms: Blooming carrots. The company now offers bunches of carrots in up to four different colors: orange, purple, yellow and white. Different types of radish and other veggies with Watermelon Radish being the centerpiece. Baby artichokes and (purple) Brussels sprouts. Joel Alan Sanders with A&B Packing Equipment Inc. The team of Suntreat/Columbine Vineyards talks about citrus and grapes. From left to right Rick Johnston, Alexandra Cody, Claire Caratan and Seth Wollenman. The team of Tom Lange. Debbie Rogers and John Kang with Zespri North America. The company is growing its presence in North America. This year, Sobeys Ontario will start selling SunGold kiwifruit while the retailer’s Quebec stores offer it already. Jessica Brady, Rebecca Catlett and Jeanetter De-Coninck-Hertzler show Arctic Golden and Arctic Granny Apbitz dried apples. The team of Naturipe Farms in the re-branded booth. Organic as well as conventional topseal packaging for Naturipe’s blueberries in two languages for the Canadian market. The team of BC Tree Fruits: Laurel Van Dam, Andrew Sandre, Lisa Linton, Chris Pollock and Lance McGinn. The apple season is winding down and the company is starting to prepare for the July/August cherry season. Shannon Boase with CKF shows the award-winning recyclable and compostable top seal punnet for strawberries and blueberries. Promoting Autumn Glory in pouch bags as well as tote bags are Brian Hake and Dan Harrington with Domex Superfresh Growers. The Sinclair team in full force. Scott Trimble with Felix Instruments proudly shows the company’s new avocado meter. Gretchen Lane and Celyne Goulet with NatureSeal. Sarah Taylor, Tom Kioussis and Rochelle Payawal with Ontario-based Gambles Produce. The team of Coastline Family Farms is walking the show. Larry Cox, Tina Cox, Tami Gutierrez and Robert Verloop smile for the camera. Two new products from Red Sun Farms: Sweetpops and Sweetpeps. Sweetpops are greenhouse grown tomatoes available in 10 oz. and 1.5 lb. topseal packaging. They were launched at last year’s PMA Fresh Summit. Just last month at SEPC the company launched its Sweetpeps: an 8 oz. bag with sweet peppers. Craig Slate and Frank Camera with SunFed are walking the show. The Star Group is focused on reducing plastics. Smiling in the picture are Adam Hormis, Jessica Wells, Kevin Quirk and Jon Karwacki. Pre-ripened pears from the Star Group. Jim Grabowski and Lauren Melenbacker with Well Pict. Strawberries from Oxnard on display at Well Pict's booth. The team of Highline Mushrooms. Andrew Sable and Avery LeFils with Village Farms show different tomato varieties and packaging. Kristina Conrad with Evans Fruit Company shows a Red Delicious apple that is shipped all over the globe. Ben Harmon and DJ Ryan with Anthony Vineyards. Proudly showing Cuties, kiwifruit and organic grapes are Howard Nager and Rob Kenney with Sun Pacific. Walking the show are Tim Cavanaugh, Dennis Jackson and Robbin Erickson with First Fruits Marketing of Washington. Headquartered in Ontario, Canada, but working with partner growers across the North American continent is Gwillimdale Farms. From left to right: John Hambly, Cristina Hambly and Quinton Woods. Gwillimdale Farms specializes in mixed loads. Juan Alarcon and Jack Howell with the Tropical Division of Fyffes North America show bananas and pineapples. Church Brothers Farms in present to talk to its Canadian foodservice partners. From left to right Neil Milburn, Penny DeSalvatore and Ernst van Eeghen. Jim Helseth, Dave Oman and Jeff Helseth with Twist-Ease. Dino Dilaudo and Tony Cappelli with Westmoreland-TopLine Farms show greenhouse grown San Marzano-style Roma tomatoes. They are available in bulk as well as packaged. Peak of the Market always has a unique booth. This year, they attracted visitors with a huge spinning wheel. Brett Burdsal with Dayka Hackett is walking the floor. Shiho Uzawa and Jaap Dane with Windset Farms show grape tomatoes in topseal packaging and also talk about one of the company’s most recent product additions; basil. Scott Ross with West Pak Avocados. Walking the show are Jose and Ricardo Roggiero with Freshway Produce. The team of the Wonderful Company stand in front of the display that tells the story about the company’s vertical integration. From left to right: Lindsey Abrahams, Michael Catalano, Jonathan Popham, Julie Trepanier, David Anthony and Jez Balsa. CPMA’s Freggies program promotes fruit and vegetable consumption for children. This group of schoolage children is walking the show with their mascot and learns about fresh produce. The team of Catania Worldwide: Alejandra Diaz, Mario Masellis, Andrew Catania, Andrew Amodeo, Kurt Cappelluti, Paul Catania and Lila Baig. Sarah Yancho and Sharon Robb with North Bay Produce. Sugar Snaps and French Beans from North Bay’s vegetable program. The company sources its vegetables in Peru and Guatemala. Canada is an important market for North Bay’s vegetable program. Jon Esformes and Lyle Bagley with Sunripe Certified Brands smile for the camera. David Crisafi and Kevin Payne with Zest Labs. Paul Newstead with Domex Superfresh Growers stepped out of the booth to get a feel for what’s happening on the show floor. Promoting North Carolina sweet potatoes are Jim Young, Don Sparks and Hunter Gibbs with Nash Produce. Matt Wentzel and Will Ison with EarthSource Trading. Johnston Farms is known for its Blue Jay California citrus. Pictured are John Clerou, Blue Jay mascot and Derek Vaughn. From California citrus, the company will transition into potatoes, doing business as Mazzei-Franconi Co. LLC. Heather White with NatureSweet shows a tomato medley and sweet mini peppers from the company’s Brighthouse Organics line. NatureSweet’s most recent expansion into conventional broadline products including peppers, cucumbers, beefsteak tomatoes and TOVs. Krystal Vanlandschoot and Matthew Neidlinger with Emerson. Ulf Colin and Gerd Uitdewilligen with Emerson are walking the floor. Brian Gannon and Shannon Curry with Florida-based Pero Family Farms. Award-winning 'Zip Pop' Dual compartment Steam bag from Schur Star Systems. The bag contains both fresh produce and seasoning, but in different compartments. Bill Dinham and Denise Hinkley with Chelan Fresh show Rockit apples. Jay Johnson, Albert Quintero and Mark Kirsch with Driscoll’s. Brian Gomez, Christine Connell and Dan Acevedo with GreenFruit Avocados talk to customers about their Nature Grown organic label. Janett Orosco and Jenna Rose Lee with Mission Produce. Mayela Zapata and Wilhelmina de Jager with the BC Blueberry Council. Kirk Crane and Heather Wood from Awe Sum Organics. They have a new citrus program out of California with lemons, navels and valencias. Alain Routhier and Guy Milette from Courchesne Larose. The company bought the company JB Labradure. The team of Aguacates JR SA de CV and second from left is Maria Montalvo with Sinclair. Wim van den Burgh from Mucci Farms. He just moved from Holland to Kingsville. CPMA is looking forward to seeing you in Toronto next year. 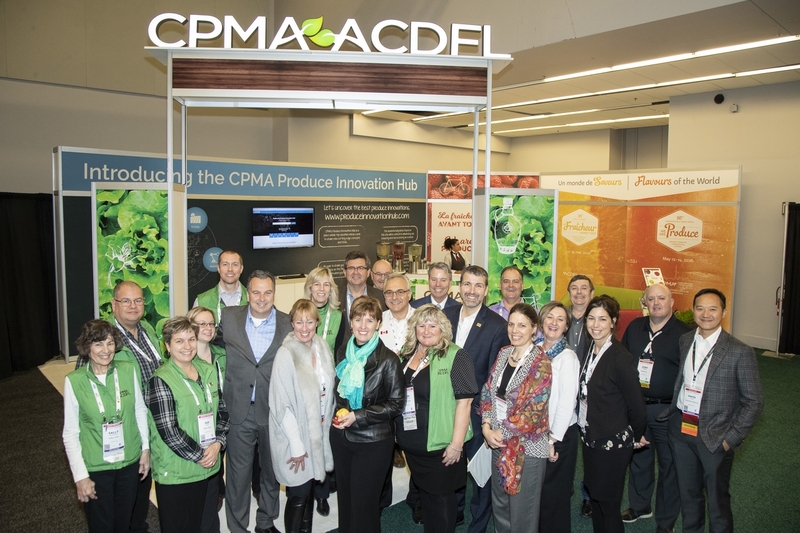 In addition to CPMA staff, the photo also includes the Honourable Marie-Claude Bibeau, Canadian Minister of Agriculture and Agri-Food, Oleen Smethurst, 2019-2020 CPMA Chair, Les Mallard, 2018-2019 CPMA Chair, Ron Lemaire, CPMA President, as well as representatives of various CPMA member companies.